CWIF is where livestreaming began for us. The guys and girls who own the brilliant Climbing Works in Sheffield let us test our skills out over three years ago on our first ever stream (minus some embarrassing pieces to camera from the office which were thankfully streamed privately on our channel!). In 2018 we upped our game and brought them even more fancy bits and pieces. The venue is actually pretty challenging with a large fan in the way of what could be the best wide shot, a cramped space leaving no room for getting up high or much choice at all for where to place cameras, and to top it all off the comp happens without a lot of light. Light and challenging camera angles aside its still one of our favourite events of the year, and we’re always given a pretty free reign on the production. This year we asked World Champion and Adidas athlete Shauna Coxsey to join the presenting team, so with seasoned pro’s Mike and Gaz in the studio and Shauna on the matts we had all angles covered. Our technical whizz Sim gave us a whole heap of new graphics including a route info graphic including a wall angle picture, wall temperature, route setter and style of problem. Just some of the graphics we used! We always recommend livestreaming the semi-finals and finals of any competitive sport. 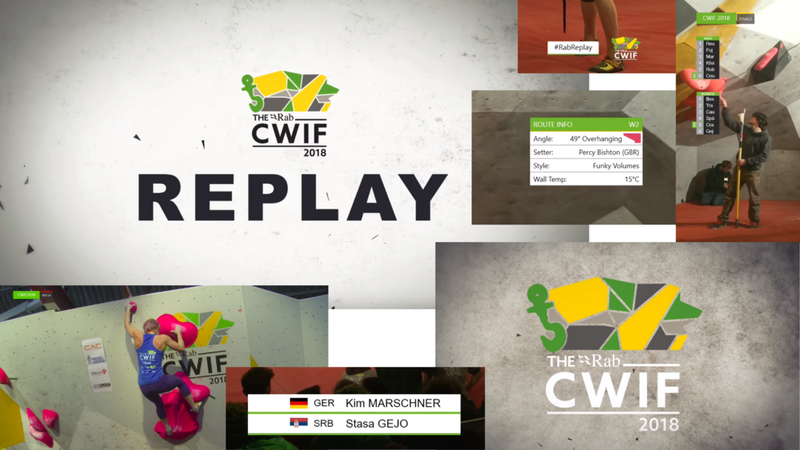 CWIF is no exception and we produced a full show for the finals with pre-filmed content for the build up show.